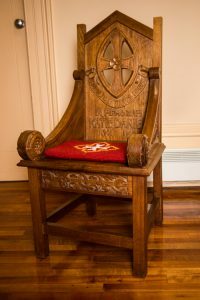 Memorial chair carved 1919, St Michael's Collegiate School, Hobart . Who was Nellie Payne? This chair was carved in memory of Mrs Katie Daniels (née Woods), a former pupil. No more detail is known about this chair. If you have further information please contact Westbury and Districts Historical Society through the contact page.